INDUSTRY.co.id - Jakarta - Encouraging the increase of non-cash transactions, especially in the transportation segment, Bank DKI supports the payment system of Soekarno Hatta Airport Train which is managed by PT Railink by using Bank DKI card product for regular ticket and Personal Frequent Rider. This was conveyed by Bank DKI Business Director Antonius Widodo Mulyono after the inauguration of the Personal Frequent Rider program and the signing of a memorandum of understanding on the provision of a special prepaid card for Perfeq Rider program for the railway users of Soekarno Hatta airport between PT Railink and 6 banks including Bank DKI in Jakarta on June 7, in its release (13/06/2018). 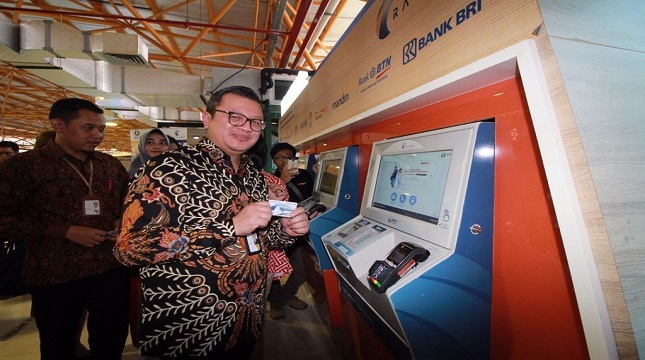 Antonius Widodo tells customers of Bank DKI card holder of Kombo ATM (ATM which also has JakCard function) and also JakCard Card holder can make payment of ticket payment transaction for regular program and Personal Frequent Rider. He also added that Bank DKI has experience related to payment system in transportation sector where JakCard can also be used in Trans Jakarta. JakCard currently also can be used to make payment transactions in the tourist area of ​​the National Monument, Ragunan Wildlife Park, Museum of Arts & Ceramics, meter parking payments and Transjakarta. Furthermore, he conveys the airport transportation users quite easily using JakCard. By using contactless-chip technology, the airport transportation railway users are close enough to JakCard on the reader (contactless card reader). Up to April 2018, the number of JakCard cards circulating in the community has reached 781 thousand cardholders with transaction value reaching Rp 15.60 billion. Railink has operated a public railway on December 26, 2017. Soekarno-Hatta Airport trains serve passengers from and to Soekarno-Hatta Airport at Sudirman Baru Station stops in Sudirman, Central Jakarta and Batu Ceper Station, Tangerang, with time travel 55 minutes. In the near future, the travel time will be shortened to 40 minutes, and the service route is extended to Bekasi. "With this cooperation is expected to provide comfort, convenience for airport train passengers and provide benefits for the company. This cooperation is one of the implementation of our corporate vision (Bank DKI) to become a modern and high-value regional bank that maintains a balance between profit and development of Jakarta ", Widodo concluded.